These soccer players terms, lingo and jargon are part of sports gamerisms, Define Your Game! Soccer Terms, part 2 continues for soccer players and fans who dream about Hat Tricks. Encroachment: during a goal, penalty, corner or free kick, the other team must be at least 10 yards away or as stated by the rules. Far Post: refers to the goalpost that is furthest from the ball. Field: this is where the action takes place. Flick Header: lingo for a player who deflects the ball with his/her head. Foot Trap: player who uses his/her foot to manage the ball. Football: recognized name for soccer worldwide not to be confused with American football where different rules and playing methods apply. Formation: term for players assigned field positions. Forward Pass: made towards the challenger's goal. Forwards or Forward Line: also known as strikers or wingers, these players are in charge of scoring for the team. Foul: rule violation resulting in a free kick. Free Kick: given to a player when a foul penalty is called against the other team. Front Tackle: defender who tries to move the ball away from a challenger by a head-on approach. Give-and-go or Wall pass: strategic 3-step move where a player passes to a teammate then runs to the open awaiting the return of the ball. Goal: a double meaning in soccer. It can refer to the apparatus consisting of one bar going across with two supporting poles and a net attached where each team attempts to put the ball to score. It can also mean the act of kicking the ball into the goal. Goal Area: measuring 20 X 6 ft deep located in front of each goal at either end of the field. Goalkeeper or Goalie: one of the most important players of the team, he/she can use the hands when the ball is in play and wears a distinctive jersey or shirt. Goal Kick: occurs when the ball is kicked away from the goal. Goal Line: area of the goal where the ball is required to completely cross to score. Goalmouth: refers to the front area of the goal. Goal Posts: support the crossbar and each measure 24 ft across and 8 ft high. 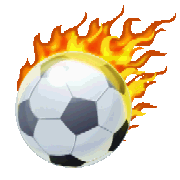 Golden Goal: lingo for the goal that wins and completes the soccer game. Hacking: lingo for the kicking a challenger's legs—could be foul worthy. Halftime: intermission slotted between 2 periods/halves of the game. Halfway Line: the line dividing the field in half. Handball or Handling: the act of touching the ball in play with your hands. This infraction results in loss of possession and is a foul. Hat Trick: jargon for 3+ goals by a single player in a single game—tip of the hat for this admirable achievement. Holding: the act of restraining an opponent during play. Impeding or Obstructing: physically blocking or obstructing and opponent during play. Indirect Free Kick: kick requiring the touch of another player for a goal to be scored. In play: occurs when ball is within field boundaries and not stopped by a referee call. Injury Time: amount of time added to a period of play because of injuries/stalling by a team as determined by the referee. Instep Drive: refers to a precise and strong shot made from the instep of a soccer player's foot. Jockey: action to play for time when an opposing ball carrier is near the goal in order to allow teammates to assist with the tackle. Juggling: lingo for controlling the ball in the air using a player's body parts other than the hands/arms. When done skillfully, it's an entertaining sight to see. Kickoff: occurs at the game start or re-start where a player passes to a teammate from the center. Kicks from the Mark: another name for a shootout at the end of a tied game where a winner must be determined. These are a series of penalty kicks taken by each team. The suspense mounts for both players and fans. Lead Pass: strategic calculation whereby a forward pass reaches a teammate correctly, so that he/she can continue the drive. Linesmen: game officials who monitor the side and goal lines, signal with a flag and assist the referee. Loft or Lob: refers to a high-flying kick. Man-to-Man or Marking: refers to a strategy whereby a defense player marks or covers an opposing forward player. Match: refers to a soccer game and the action is on to the delight of both players and fans. Midfield: field area close to the midfield line. Midfield Line or Centerline: refers to line that halves the field area by width. Midfielders: term for players who play behind the forwards of a team and connect the offensive/defensive units. Misconduct: behavior deemed by an official to be inappropriate, unsportsmanlike or detrimental to the game. Typically results in a yellow or red card and possible ejection from the contest. Mismatch: a very skillful player versus an average player is not a good match. National Team: speaking of skillful players, this is such a group who play for their country at international matches like the World Cup. Near Post: refers to the post closest to the ball. Net: refers to either the goal or the material covering the frame of the goal. Nutmeg: jargon for action of threading or moving the ball through the space between a player's legs. Obstruction: action used by a defender to curtail the play of an offensive player. Official Game Clock: used by the referee to monitor when each period ends. It should be noted that the clock does not stop during game play. Officials: includes 2 linesman and referee who monitor the score/time and call fouls according to the rules of the game. Offside Line: the limit to which a defender can proceed without the ball while not being penalized. Offside Position: refers to an attacker in position in order that fewer than 2 opposing defensive players are between him/her and the goal being attacked. On Defense: refers to the team players who do not have the ball. On Offense: alternatively, refers to the team players who do have the ball. Open: term for attacker who is not covered or marked by an opposing player. There is an advantage here—go fer it! 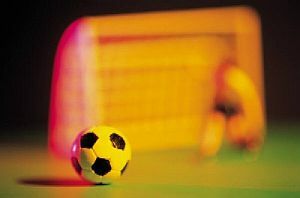 Out of Bounds or Out of Play: refers to soccer ball that has moved outside the official boundaries of the playing field. Outlet Passes: this action that begins a counterattack, occurs when the ball is moved towards the opposing team's goal. Overlap: occurs when a forward moves from the sideline to center field in order to allow a teammate to advance the ball undefended along the side of the field. Overtime: term for additional periods played after a regular game has been completed in order to break a tie score. This is Part 2 of 3 for the Soccer Glossary.